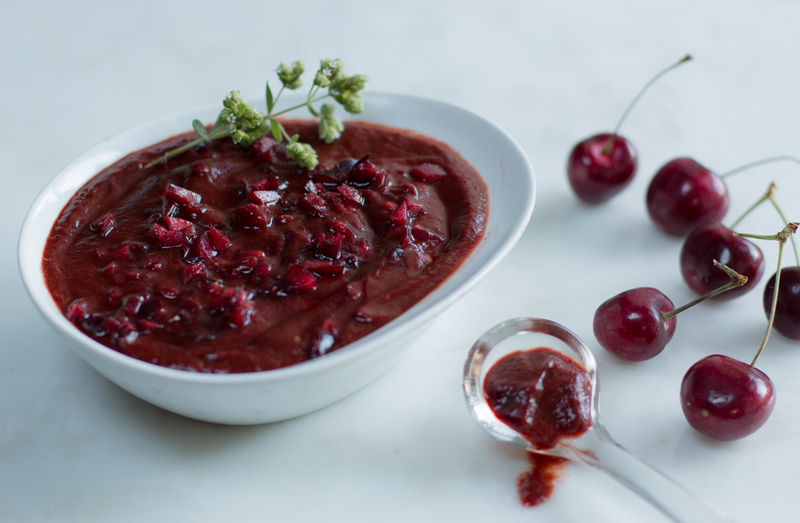 A fabulous Basting and Dipping BBQ Sauce to make During Cherry Season! Not too sweet bursting with Fresh Cherry Flavor… and a gorgeous color. 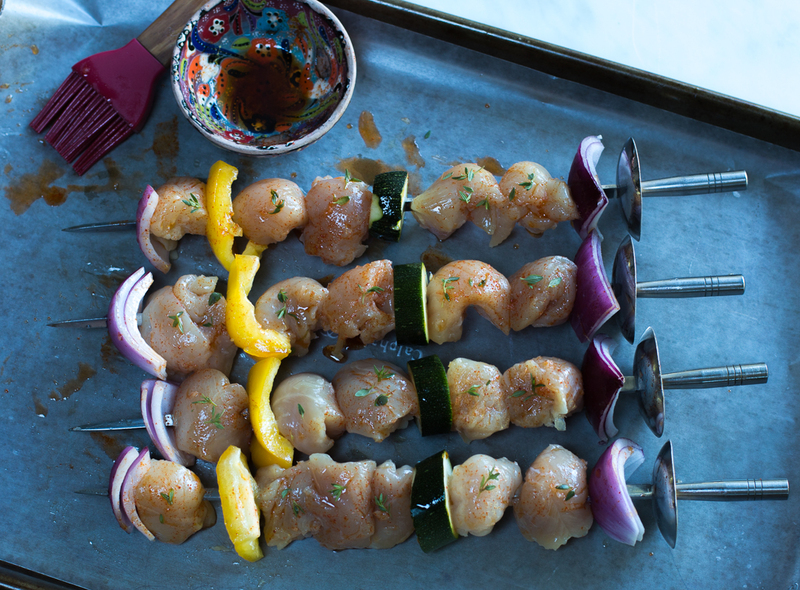 I’m all for convenience when grilling… marinate morsels of food and reach into the cupboard for a barbecue sauce. Too sweet, gloppy, salty, too expensive, loaded with preservatives – and the worst is that artificial “smoke flavor” – yuck! So, I make my own. 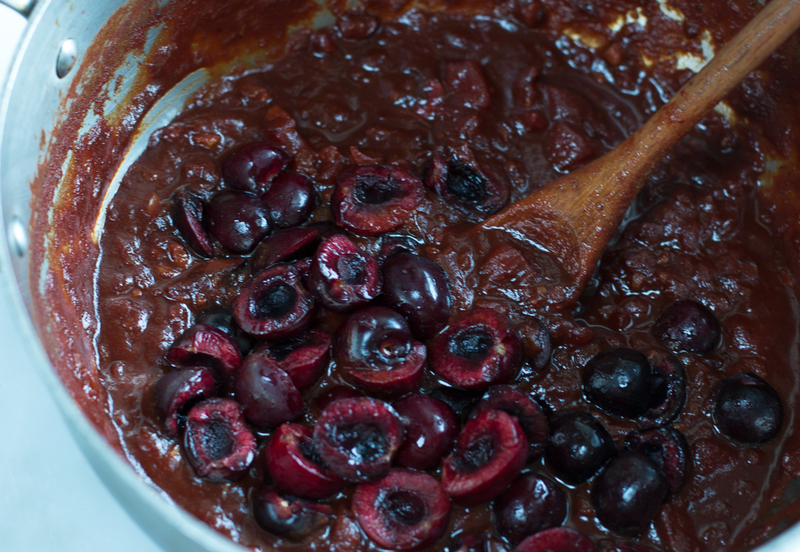 This Fresh Cherry BBQ Sauce batch makes 4 cups. Sounds like a lot, right? The extra can stay in the fridge for a few weeks, can be frozen, or better yet “can” in a hot water bath for 15 minutes and store some – and give a lovely gift to your friends. Home made barbecue sauce is vibrant, velvety, flavorful and full-bodied. You have control over the sweetness and heat. I’ve added a fraction of sugar called for most recipes and rely on the natural sweetness of Fresh Cherries. For a naturally-smokey flavor canned chipotles in adobe sauce do the trick beautifully. To Make: I cook the sauce ingredients for 30 minutes until slightly reduced – so all the flavors meld well. The main ingredients are: sweet onions, garlic, spicy brown mustard, organic molasses, apple cider vinegar, tomatoes in juice, tomato paste, pure maple syrup, coconut palm sugar and smoked paprika. 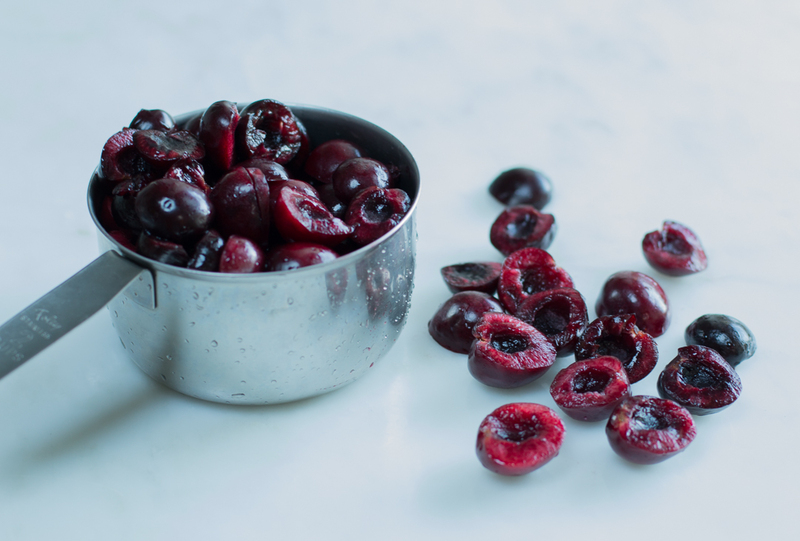 2 1/2 cups of pitted cherries are added at the end – so that their color and texture stays bright. 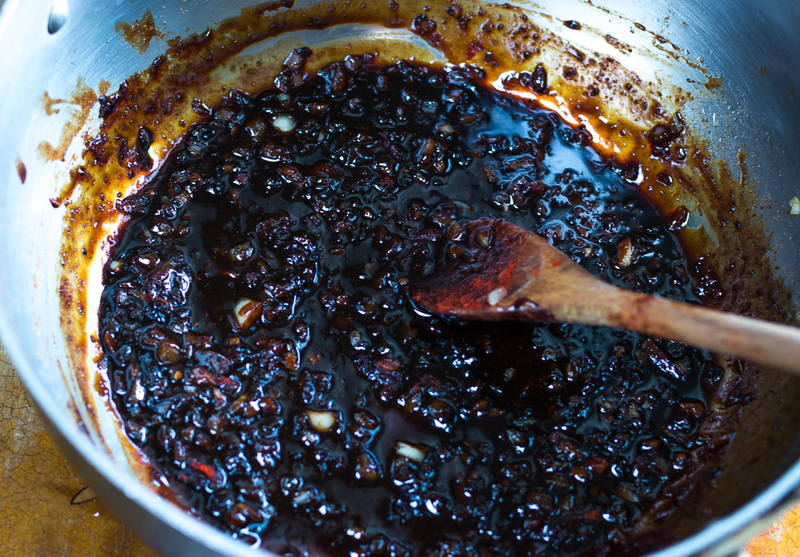 I think it’s super-gratifying to make your own BBQ sauce – and have it ready for any grilling cook-outs. Cherries are in peak season from May to August. I notice better grocers and health food chains have better quality cherries. I’m all for looking for them at my local supermarket on sale – yet the quality is many times superior in more upscale shops. They are simply charging more for a choice fruit. 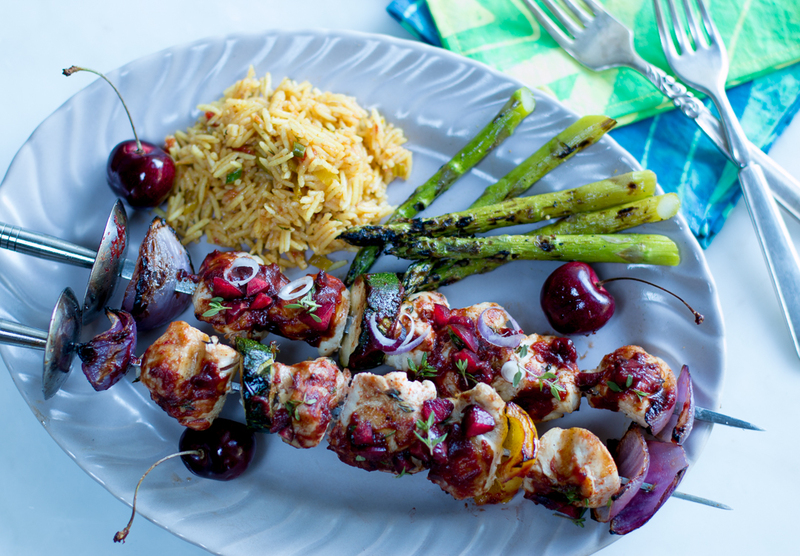 See my recipe for Chicken & Veggie Kebobs slathered with Fresh Cherry Barbecue Sauce. Once you have the sauce – the kebabs cook quickly, about 10 minutes and are a real family and party pleaser! 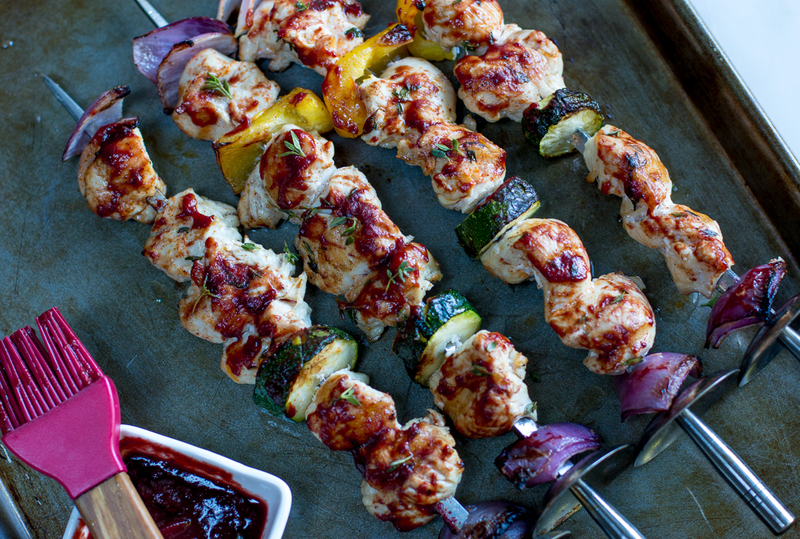 Choose the vegetables you have the add the the skewers – just make sure they are the size of your cut chicken. If they are too large the chicken will not be hitting the grates, and will not cook properly. Cherries are low in calories, rich in flavor and nutrients, and requiring hardly any preparation. They contain pectin, a type of soluble fiber that is noted for helping to lowering cholesterol. One cup of sweet cherries has only 87 calories, provide vitamin C and good amount of potassium. The intense color of cherries is due, in part, to the pigment anthocyanins, which are flavonoids that researchers theorize may have health benefits. Cherries, which are members of the same fruit family as peaches, plums, apricots, and almonds, are often regarded as a “dessert” fruit for use in pies, or perhaps as a garnish for cocktails. Tart cherries are also used to make juice concentrates that may offer some unique health benefits. Some of the most notable health effects. While there are several varieties of sweet cherries, the most common is Bing. These fresh cherries are quite dark – sometimes almost purple or black with an intensely sweet, vibrant flavor. Look for: When purchasing, buy dark very firm cherries. I pinch them a bit and do not buy if they are soft – that’s an older cherry and will not be as sweet and juicy. Turkey leads the way in cherry production, with the United States coming in a close second. Most sweet cherries are grown in Washington, California, Oregon, Wisconsin, and Michigan.